Get fit fast with SparkPeople’s Coach Nicole. 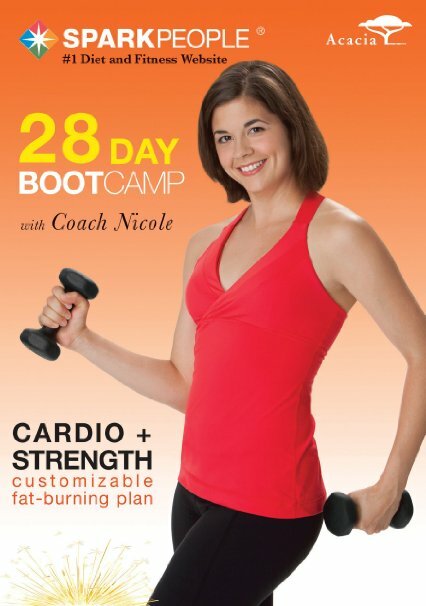 High-energy cardio routines combined with full-body strengthening exercises keep your muscles guessing; Coach Nicole’s mellow yet positive, supportive style will keep you motivated as you trim inches, build lean muscle, and gain confidence. I love this workout because it’s divided up into 4 great routines (plus a warm up and cool down) that you can mix and match depending on the amount of time you have and your workout focus for the day. All the workouts are geared towards newcomers and novice exercisers. Each routine features different levels of difficulty for every move so you always have something to work towards. You’ll need a mat, dumbbells and a chair. And stick around after the cool down for some tips on how to work your abs at the office and how to get the most from your cardio workouts. Cardio Blast: This short cardio routine will train your heart and lungs while blasting fat and calories. 12 minutes. Cardio Sculpt: A quick interval routine alternating high energy cardio bursts with targeted sculpt moves. Multitask your workout by burning and toning in one compact workout. 11:35 minutes. Cardio Weight Push: Grab your weights and get ready! This time saving routine burns fat and tones up the whole body. The workout alternates resistance training using dumbbells with cardio bursts plus a few balance challenges thrown in for good measure. 20:51 minutes. Cardio Kettle Bell: Are you ready for a new challenge? This kettle bell inspired workout builds strength and endurance to help you reach a whole new level of fitness. At the end you’ll be sweating — and smiling. 30 minutes.